Fender may be most well known for their electric guitars – the Stratocaster and Telecaster in particular – and amps but less know about Fender acoustic guitars. Fender has a range of acoustic guitars from very cost-friendly to more premium models. Below are the Fender acoustics available currently. The paramount series features 6 different guitars – 3 standard models and 3 deluxe models. The deluxe models are all solid wood and feature East Indian Rosewood back and sides and a Sitka Spruce top. They come with ebony fingerboards, a bone nut and an ebony bridge with bone compensated saddle. The deluxe models have a recommended price of $999.99. The standard models are all solid wood and feature Mahogany back and sides and a Sitka Spruce top. They are equipped with a rosewood fingerboard, a bone nut and a rosewood bridge with bone compensated saddle. All models are equipped with Fender®/Fishman® PM electronics and those electronics are specifically set up for each different shape. Quartersawn scalloped X bracing is used on all models. The Classic Design series of guitars features a number of options. O.K. that looks daunting but let’s break it down. Note that any of the models a title that start with “CD” are dreadnoughts, “CF” are Fender’s folk shape/size, “CP” are parlors and “CJ” are jumbos. There are 4 different versions of the CD-320. The CD320ASRW has Indian Rosewood (solid) back and sides in place of the Mahogany and the CD320ASRWCE is the Rosewood version with a cutaway and electronics. The 320 series go for between $599 and $799 with the models with electronics costing more and the rosewood models costing more than the mahogany models. The CD 200 series features 5 different guitars. The CD-220SCE (dreadnought) has a solid spruce top and laminated ash burl back and sides. 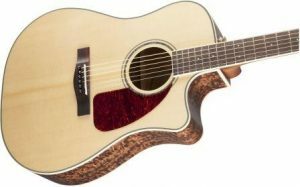 The CD-220SCE All Zebrano (dreadnought) – as it sounds – features laminated Zebrano back, sides and top. The CD-280S Dreadnought has a solid spruce top and laminated rosewood back and sides. It doesn’t have a cutaway or electronics. The nut width is a very narrow 1.58” (40.1mm). The CD-280SCE has the cutaway and electronics. And finally, the CD-290SCE Jumbo Maple. This guitar has a solid spruce top and laminated maple back and sides. It is a jumbo shaped guitar with a 1.625” (41.3mm) nut width. The CD-140 series features 7 different guitars. 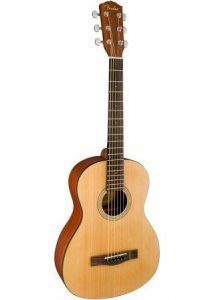 The CD-140S is the basic model has a solid spruce top and laminated mahogany back and sides. The 140SCE has a cutaway and electronics and comes in either black or natural. The 140S All Mahogany is the same as the 140S except that it has a Solid Mahogany top in place of the Spruce top. The 140SCE All Mahogany is the same as the 140SCE except that it has a Solid Mahogany top in place of the Spruce top. The CD160SE 12 String is the 12 string version of the 140S – it has a 1.89” (48mm) nut width and has electronics but no cutaway. It’s available in black and natural. The CF140S Folk is Fender’s “folk” shape version of the 140S and also has a narrower neck (1.625” – 41.3mm). The CF140SCE is the CF140S with cutaway and electronics. The CD 100 series has 6 models. The CD-100 is the standard model and has a laminated spruce top and laminated mahogany back and sides. The CD-100CE has a cutaway and electronics (Fishman® Isys III System with Active Onboard Preamp and Tuner). The CD-100 Left hand is the left handed version of the CD-100. The CD-100CE left hand is the left hand version of the CD-100CE. The CD-100 12 string is the 12 string version and has a 1.89” (48mm) nut width. Finally, the CP-100 Parlor is the parlor sized version of the CD-100 and has a sunburst finish and a scale length of 24.75” (628mm). There are 6 different models of the CD-60. The standard model (the CD-60) is very similar to the CD-100 and has a laminated spruce top and laminated mahogany sides and comes in natural, black and sunburst options for the finish. The CD-60CE has the cutaway and electronics. Both versions also come as all Mahogany which has a laminated mahogany top in place of the laminated spruce top (CD-60 All Mahogany and CD-60CE All Mahogany). The CF-60 Folk has the folk sized/shaped body and has a slightly wider nut width of 1.73” (44mm). The CF-60CE is the Folk version with a cutaway and electronics. The MA-1 ¾ is a ¾ size guitar (as it sounds). It has a parlor shape with a laminated agathis top and laminated Sapele back and sides. The MA-1 is very inexpensive and great as a starter guitar for a kid or as a travel guitar. The FA-100 is a dreadnought with laminated spruce top and basswood back and sides. The FA-125S is a folk size guitar and has a solid spruce top and laminated mahogany back sides. It is a bit of step up from the FA-100 as it has a solid top, scalloped bracing & graph tech nut and saddle. The FA-125S Mahogany has a Solid Mahogany top in place of the Solid Spruce top. 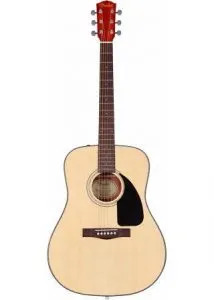 The DG-85 is a dreadnought guitar and has a solid spruce top and laminated mahogany back and sides. Finally we have the California Series. This series features a number of very different types of guitars and is based around Fender’s 1960’s acoustic guitars. All of the guitars in this series (except for the T-Bucket models) feature an electric guitar style headstock. The Kingman SCE is the first I’ll look at here. It has a solid spruce top, solid mahogany back and laminated mahogany sides. I have to admit that this is the first guitar I’ve come across with different material for the back and sides. It has a cutaway and in built electronics (Fishman® Presys Pickup System with Active Onboard Preamp and Tuner). The Kingman ASCE is basically the same guitar with a different look. The Kingsman Jumbo SCE is the same except that it is a Jumbo shape/size, the back is laminated mahogany and it features quartersawn scallped x bracing. The Malibu CE is Fender’s folk shape/size and has a laminated spruce top and laminated mahogany back and sides. 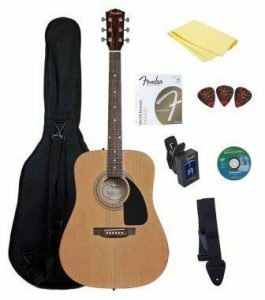 It comes with a cutaway and electronics (Fishman® Isys III System with Active Onboard Preamp and Tuner). The Sonoran is a dreadnought guitar with a solid spruce top and laminated mahogany back and sides. The Sonoran comes in a non-cutaway/non-electronic version (Sonoran S) or a version with a cutaway and electronics (Fishman® Isys III System with Active Onboard Preamp and Tuner) – the Sonoran SCE. There are several color options for the SCE – Natural, Lake Placid Blue, Black, Candy Apple Red, Pink and Surf Green. Like it sounds the Stratacoustic series features guitars that look like Fender’s classic Stratocaster electric guitars. The Standard Stratacoustic has a laminated spruce top and a 1-piece fibre glass back and sides. It has a double cutaway and electronics (Fishman® Isys III System with Active Onboard Preamp and Tuner). The Stratacoustic plus has an Inca Silver finish and comes with a built in mini USB port for directly plugging into your smart phone, tablet or computer for recording. The Stratacoustic premier has a flame maple top with a 3 color sunburst finish and also has the USB port. Like the Stratacoustic series the Telecoustic series of guitars emulates their electric brother – this time the Telecaster. They feature the telecaster style body and headstock. Otherwise they are very similar to the Stratacoustic. The Standard Telecoustic has a laminated spruce top and a 1-piece fibre glass back and sides. It has a single cutaway and electronics (Fishman® Isys III System with Active Onboard Preamp and Tuner). Like the Stratacoustic the Telecoustic comes in a plus and premier model. The Plus (pictured) has a Sherwood green finish and comes with the micro-USB port for recording with your smart phone, tablet or computer. The premier has a flame maple top and a 3 color sunburst finish and also has the USB port. Finally we come to the T-Bucket series. The T Bucket guitars are the only one’s in the Califronia series without the electric guitar style headstock. There are 3 models. The T-Bucket 100CE is a dreadnought with laminated spruce top and laminated mahogany back and sides. It has a cutaway and electronics (Fishman® Isys III System with Active Onboard Preamp and Tuner). The T Bucket 300CE model has laminated mahogany back and sides and either a Flame Maple, Quilt Maple or Quilt Ash top (depending on the color). It comes in either 3 color sunburst (Flame Maple), Black (Flame Maple), Blue (Quilt Maple), Amber (Quilt Maple), Violet (Quilt Ash), Dark Brown (Quilt Ash). The T-Bucket 400CE has a Flame Maple top and Flame Maple back and sides. There you have the extensive collection of Fender acoustic guitars – lesser known than their electric brothers but a good selection none-the-less as you can see (and I’m sure there are some that I’ve missed here). In my opinion Fender are great at producing decent quality acoustics for a reasonable price. You can check out all of my Fender acoustic guitar reviews at the links below. You helped me a lot to decide which Fender is best for me. I really appriciate your invested work in this review to help out other people like me! Can you help me to decide electric or acoustic guitar is better to play blues music? It definitely depends on the type of blues music you want to play. If you like modern blues and want to play modern blues then electric guitar is probably better – though I use the term modern very loosely – Muddy Waters was playing the blues on electric guitar in the 1950s. That also doesn’t mean you can’t play modern blues on the acoustic but if you are playing with a band, it would be played on an electric guitar most often. If you like your blues slow and/or old school or if you are playing solo – then an acoustic guitar is probably better. I prefer blues on the acoustic guitar – but then I really like the old school blues – like Robert Johnson, Son House, Charlie Patton etc. I also like modern blues but I still prefer it minimal. I enjoy the blues the most when it’s an acoustic guitar and a voice – and maybe a harmonica. But that’s all personal preference of course. Short answer – I think in a band (with drums, bass etc) I think electric guitar works better – but playing solo it’s better with an acoustic guitar.